We’ve been waiting a long time for the new Ford; its European launch was delayed when production was moved from Belgium to Spain. Now it’s here, the Mondeo faces competition from the updated Mazda 6, the revised Škoda Superb and the new Volkswagen Passat. Is it still a front-runner against so many strong rivals? After towing with it at the Tow Car Awards in the spring, we’ve had the chance to spend longer behind the wheel of the 150PS (148bhp) 2.0-litre TDCi Econetic Zetec. But, of course, we are keen to know what tow car ability it has – and is the Ford Mondeo still one of the best family cars? The previous generations have all towed well. Does the latest car continue that tradition? The Econetic may be the green Mondeo – with lower emissions thanks to tweaked suspension for better aerodynamics, and low-rolling-resistance tyres on 16in alloy wheels – but it can still tow most mid-sized caravans. The car’s kerbweight is unchanged whether you choose the Econetic or the regular 2.0 TDCi. Weighing in at 1578kg, the Mondeo has an 85% match figure of 1341kg. That’s well within the 1600kg towing limit which Ford quotes for the car (although the VIN plate suggests an 1800kg maximum, the same as for a non-Econetic model). We matched the Ford to a Bailey Pursuit 540-5 with a mass in running order of 1229kg. Straight away, the Mondeo felt at home with towing. Within a couple of miles we were driving up a steep A-road hill, and the Ford’s diesel engine pulled to the top in fourth gear without becoming laboured or losing speed. The Econetic’s low emissions and strong economy clearly don’t come at the expense of performance, thanks to 258lb ft of torque. It’s enough muscle to pull the Bailey from 30-60mph in 12.5 seconds, and means drivers will be able to overtake confidently even when towing. It’s a flexible engine as well as a strong one. Despite pulling around 1500rpm at an indicated 60mph in sixth gear, we rarely needed to change down to fifth on the motorway. 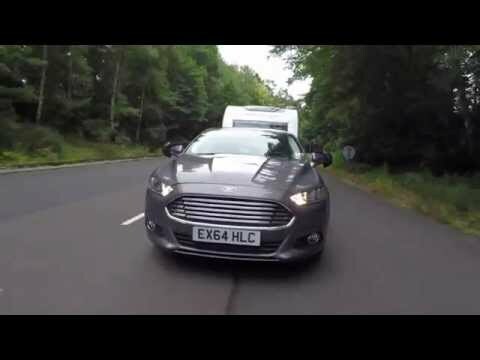 If we did get caught behind slower traffic, the Mondeo pulled back up to speed without fuss, taking 6.4 seconds to get from 50-60mph in fifth gear with the Bailey in tow. It’s always nice to have some punch in reserve, but it’s stability that’s really essential for relaxed and enjoyable towing. We’ve no complaints on that front. At the Tow Car Awards, when pulling a caravan without a stabiliser hitch at 60mph and beyond, some drivers noted a little movement. But sticking to 60mph on the motorway, when pulling a van with a stabiliser hitch, we had no issues at all. We’d happily tow mile after mile with the Mondeo. The Ford gave a good account of itself in the lane-change test, too. Although the steering felt light and there was body roll when pushed, the Mondeo took the van by the scruff of the neck and firmly put it in its place, even when it was skidding. Front-wheel-drive cars aren’t at their best in the hill-start test, but the Mondeo mostly took it in its stride. The electronic handbrake engaged and released smoothly and more quietly than many similar systems and, although some clutch slip was needed, the Ford pulled to the top of a 1-in-6 slope without undue fuss. In normal towing, the brakes were easy to apply smoothly and provided the bite required to stop car and caravan after just 10.4m on a dry track. Other than needing a careful balance of clutch and throttle in the hill start, the Mondeo doesn’t do a lot wrong on tow. Ford has a well-deserved reputation for making cars that appeal to keen drivers. The latest Mondeo lives up to that. On twisting roads the steering can be a little too light and the car doesn’t feel quite as sharp as it used to. Some of the previous model’s sportiness seems to have been traded in for a more grown-up, refined feel. The more you drive the car, though, the more you appreciate how grippy and well-balanced it is. Many drivers will welcome the improved ride comfort and the quieter cabin. The Econetic may have lowered suspension, but small 16in wheels with tall tyres contribute to impressive bump absorption – solo or on tow. Past generations of Mondeo have been noisier on the motorway than the Volkswagen Passat, but the difference in high-speed refinement is much narrower than it was. Ford has deadened engine noise so it doesn’t become intrusive. There’s a little road noise at speed but nothing excessive. The Mondeo has been made with the needs of long-distance drivers in mind. The ride around town remains comfortable, although thick rear pillars obscure the driver’s view when reverse parking. As a solo drive the Mondeo isn’t the clear class leader it used to be, but it’s still enjoyable to drive. What’s more, it’s now more comfortable and refined. The driver and front seat passenger have lots of head and legroom. There’s plenty of adjustment to the steering wheel and the driver’s seat, so people of most shapes and sizes should be able to get comfortable. It helps that there’s a proper rest for the driver’s left foot and that the pedals are well positioned. The dashboard, even on our relatively affordable Zetec test car, is dominated by the Sync infotainment system. It controls the radio and stereo, the navigation system (a very reasonable £300 option on the Zetec), any connected phone and some of the air-conditioning functions, with voice control and Bluetooth connectivity. Fortunately, there are separate controls for the air-con beneath the screen so there’s no need to wade through on-screen menus to fine-tune the temperature. Those in the back seats have plenty of legroom, though not as much as they’d get in a Škoda Superb or VW Passat. The curve of the roof compromises headroom slightly, but you’d have to be very tall to mind. Air vents between the front seats supply those in the back with chilled air. Unusually, the Mondeo hatchback has more boot space than the estate, at least with the rear seats upright. The 541-litre capacity should be enough for most families’ holiday bags, despite wheelarch intrusion. Fold the seats down and the capacity increases to 1437 litres. However, it’s a shame there’s a step in the load floor. Few owners will find the Mondeo to be short of space, but some rivals offer more for passengers and luggage. Ford asks £22,845 for the 2.0 TDCi Econetic in Zetec trim, and, with a little persuasion, What Car?’s researchers predict that discounts of around £2000 should be achievable. This is a lot of car for just over £20,000. Zetec trim may be towards the bottom of the range, but it still comes with a respectable list of standard kit, including the Sync touch-screen system, which has an Emergency Assist function. This automatically contacts the emergency services with the car’s location after an accident, even if the driver cannot. Other safety kit includes driver, passenger, side, curtain and driver’s knee airbags, stability control and Hill-Start Assist to prevent the car from rolling backwards on a slope. The Econetic boasts an impressive official combined economy figure of 68.9mpg, an improvement on the standard model’s 64.2mpg. These numbers need to be taken with a pinch of salt, but we were very happy with the 32.4mpg that the car achieved while towing on a mix of A-roads and motorways. Mainstream family cars have weaker resale values, which makes them appealing secondhand, but means that the first owners tend to take a hit. What Car? predicts the Mondeo will be worth 40% of the original price after three years. That’s not a disastrous return, but the equivalent Škoda is expected to hang on to 51% and a similar VW Passat should keep 44%. The Mondeo is keenly priced and fuel-efficient, but so-so resale values prevent a higher score. The Ford Mondeo is a very fine tow car. We’ve come to expect good towing manners from Ford over the years, and the Mondeo lives up to those high standards. Despite being a fuel-efficient version aimed at company fleets, the Econetic compromises little compared with the standard model. It weighs the same as the standard car, which gives a healthy 85% match figure – as recommended by both major caravanning clubs for safe towing. The towing limit is higher than the kerbweight, so there’s nothing to stop experienced tow car drivers towing between 85% and 100% of the kerbweight. Stability at speed is excellent, even when the Mondeo is pushed hard. It mastered our lane-change test and, in an emergency stop, it posted a short stopping distance. In everyday driving, it isn’t the out-and-out driver’s car it used to be, but it’s still satisfying. With high-profile tyres and well judged suspension settings, it balances comfort and control. The Mondeo is roomy enough for adults to be comfortable in the front or the back seats, but some rivals – notably the Škoda Superb – are more so. Likewise its big boot is not class-leading. Our test car is surprisingly affordable, but still comes with ample standard kit; healthy discounts make it even better value. However, as with most mainstream family cars, resale values aren’t especially strong. All told, the Ford Mondeo is one of the best family cars, but it’s a front-runner – not a clear leader.